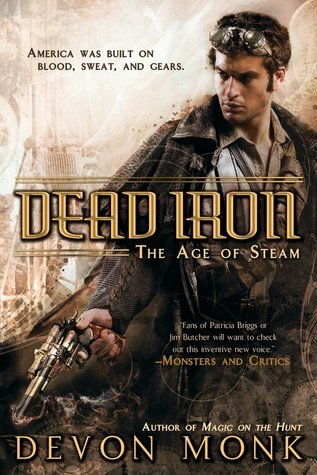 In steam age America, men, monsters, machines, and magic battle for the same scrap of earth and sky. In this chaos, bounty hunter Cedar Hunt rides, cursed by lycanthropy and carrying the guilt of his brother's death. Then he's offered hope that his brother may yet survive. All he has to do is find the Holder: a powerful device created by mad devisers-and now in the hands of an ancient Strange who was banished to walk this Earth. Cedar was cursed long ago with lycanthropy. Whenever he changes, he is sent into a murderous rage that leaves a path of death and destruction behind him. When he wakes up to the carnage, he has no memory of what happened the night before. On his first change he killed his brother and has lived with that horror ever since. Many years later, a new hope has arisen, and his brother may still live. Cedar must accept a task to find the Holder, a device that could destroy everything. He just has to figure a way to get it away from a tremendously powerful strange that is dead set on revenge against those who banished him. Time is running out, and only one will be left standing in the end. There is a whole lot going on in this book. So much that it took me a good while to really get into the story. Dead Iron is told in third person, and rotates perspectives. The rotation in itself wasn't the problem, but that as soon as you started to understand something, the focus would shift to someone else. Looking back, this actually was the best thing for the book as it allowed you to become attached to all the characters rather than just a select few. So once I got past my initial frustration, I was able to enjoy the book a whole lot more. While there wasn't really a romantic element in Dead Iron the stage seems to be set for a potential in the next. Considering everything that was happening in this book, making this believable was no small task, yet the author made it progress seamlessly. In addition to the "seeds" sown for the potential love interests, there also were several kernels given about different characters. This leaves a whole lot of potential for growth in the series, and I find myself impatient to find out the secrets that are hidden. This was my first foray into Steampunk, and I'll admit I wasn't really sure what to expect. The world the book is set in is very fascinating, as well as completely different from anything I have read in the past. I think my lack of familiarity with the genre and the world's uniqueness had a lot to do with my slow "learning curve." I have a feeling that I will enjoy the next book even more now that I have fully grasped the rules and overall concept. The characters were really substantial and I couldn't help wanting to root for them to succeed despite the odds against them. I have always loved Devon Monk's other series, The Allie Beckstrom books, and now I am happy to say Ms. Monk is definitely not a one hit wonder. 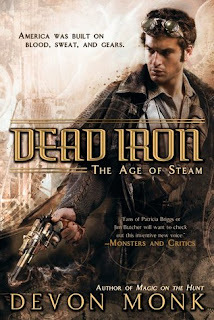 So if you are a fan of Steampunk, or even a plain old fantasy lover, Dead Iron would be a great addition to your shelves.